Orthopaedic Manifestation of Bernard Soulier Disease and Management. Division of Orthopaedic Surgery, McMaster University, Hamilton, Ontario L8L 2X2 Canada. Division of Orthopaedic Surgery, Juravinski Hospital, Hamilton, Ontario L8L 2X2 Canada. Introduction: The management of patients with coagulopathic disorders undergoing orthopaedic surgery requires a dedicated, multi-disciplinary team with detailed perioperative planning. Bernard-Soulier Syndrome (BSS) is an extremely rare disorder, affecting 1 in 1 million individuals worldwide. It is caused by a deficiency in glycoprotein 1b-V-IX which is required for normal platelet-mediated clot formation. The deficiency results in prolonged bleeding time with high risk of spontaneous bleeds. Few reports exist in the clinical literature of BSS patients undergoing major surgery. 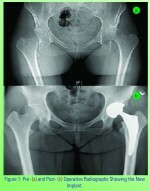 Case Report: A 40 year old, female with known BSS and developmental dysplasia of her left hip (DDH) was referred to us for consideration of left total hip arthroplasty (THA). Consultation with her Haematologist for pre-operative optimization of platelets and related clotting times together with detailed discussions of her intended anaesthesia protocol and surgery resulted in a successful operation with less than anticipated blood loss. She entered our rehabilitation program just one week after surgery. Conclusion: BSS is an extremely rare bleeding disorder that puts patients at very high risk of blood loss following surgery. 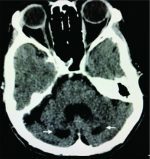 This is the first report that we are aware of describing a BSS patient undergoing a THA. A cohesive, highly specialized, multi-disciplinary team is crucial to the success of these patients. Keywords: Orthopaedic, Surgery, hip arthroplasty, Bernard-Soulier syndrome, platelets, coagulopathy, tranexamic acid. Bernard-Soulier syndrome (BSS) is a rare, inheritable (autosomal recessive) platelet disorder affecting an estimated 1 in every 1 million individuals [1,2]. Patients with BSS are at risk of severe bleeding. A mutation involving glycoprotein complex 1b-V-IX renders platelets unable to bind Von Willebrand factor (vWF) and form clots. Patients often report spontaneous epistaxis, bleeding gums or heavy menstrual periods. BSS patients require rigorous perioperative planning , however, the literature is devoid of reports describing BSS patients undergoing orthopaedic surgery. 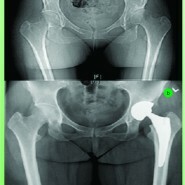 We present a young female patient with BSS that underwent total hip arthroplasty (THA) for her dysplastic left hip. A 40 year old, 83Kg female with developmental dysplasia of her left hip (DDH) was referred to us for consideration of left THA having suffered increasing left hip pain over the past three years. 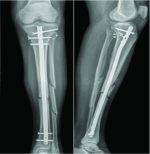 Her diagnosis of DDH was not made until adulthood despite her left leg being shorter than her right leg by 2.5 cm. She was diagnosed with BSS at the age of 18, and her haematology reports confirm 2 prior hospital admissions related to delayed bleeding following wisdom-teeth extraction at the age of 20 and cervical cone biopsy; the latter of which required transfusion with platelets and packed red blood cells (pRBC). Prior to this, she had been taking birth control pills from the age 14 for heavy menstruation. Pre-operative cross-match and group and screen of blood was conducted confirming blood type A+. Blood work also confirmed that she was not Factor XIII deficit as initially suspected (FXIII activity, 1.04 U/mL). Her glycoprotein 1b level was 15% with an estimated platelet count of 12 (x109/L) and INR 0.9. Her euglobulin lysis time was also well within acceptable limits (4.5 h). We consulted our Thrombosis, Haemophilia and Internal Medicine teams for pre-operative optimization. Having a Clinical Nurse Specialist coordinate the patient care path was fundamental to this process. Tranexamic acid (TA) 1g po TID was initiated 24 hours prior to surgery and continued until 14 days post-operatively. 20 mcg of DDAVP (desmopressin) diluted into 50 mL of normal saline was given intravenously over a period of 30 minutes, 1 hour prior to surgery. Immediately following this, she received 1 adult dose (4 units/318 mL) of pooled, buffy-coat platelets which elevated her platelets to 79 (x109/L) along with 1 unit of pRBC to bring her haemoglobin (Hb) to 135 (Table 1). Intravenous antibiotics (Ancef, 2g) were given within 30 minutes of surgery. Arterial lines and additional peripheral lines were avoided to limit potential bleeding. Induction of general anaesthesia was conducted using a mixture of intravenous propofol (170 mg), sufentanil (20 mcg), versed (2 mg) and rocuronium (50 mcg). A glideScope® (Verathon Inc., Bothell, WA, USA) was used for placement of the endotracheal tube. Anaesthesia maintenance comprised isoflurane (1.8%) with 58% O2 at 1.2L/min and air at 1.3L/min. Once sedate, our patient was positioned in a standard right lateral decubitus position, supported by a Stulberg frame (Innomed Inc., Savannah, GA, USA). A Hardinge approach was used to the left hip. Meticulous haemostasis was maintained using cautery throughout the case. Particular attention was taken to avoid undue tension through soft tissues during dislocation of the hip. Similarly, bone bleeding following transection of the femoral neck and reaming of the acetabulum and femoral canal was addressed immediately. Gauze soaked in tranexamic acid (Pfizer Inc., NY, USA, 2g in 10 mL sterile normal saline) was packed into the femoral canal and acetabulum for a period of 3-4 minutes prior to placement of implants. The femoral component (Accolade II; Stryker Canada, Hamilton, ON, CA) was impacted into the femoral canal in the typical fashion. To optimize functional range, we used an anatomic dual mobility (ADM®), bearing hip system from Stryker (Fig 1). Bleeding was minimal following impaction of either the femoral or acetabular prostheses. Muscle and surrounding fascial layers were infiltrated with 0.5% Marcaine/epinephrine (1:1000; 40 mL). The incision was meticulously closed in multiple layers followed by steri-strips™ and mepore® dressings. Systolic blood pressure was maintained below 125 mmHg throughout the surgery. Total operative time was 85 minutes. Estimated blood loss was 450 mL. Patient received a 1L bolus of normal saline intra-operatively. Her vitals remained stable throughout the surgery. Post-operatively, daily transfusions of platelets were given up to post-operative day (POD) 14. Transfusions comprised 2 single donor (232 mL), 4 plateletpharesis (208 ±44 mL) and 8 pooled, buffy coated platelets (345 ±15mL). Minor cross-match check was conducted daily. Platelet counts dropped by 40% post-operatively but recovered by POD 6 (see Table 1). DDAVP (20 mcg, subcutaneous) was continued daily until POD 4. Serum sodium levels remained stable; the lowest reading was 128 mmol/L on POD 2, recovering to 136 mmol/L by POD 6. Systolic blood pressures were also stable at 103 ±14 mmHg, the lowest (98/59) occurring POD 1. Her blood work was recorded daily, a summary of which is shown in Table 1. She was weight bearing as tolerated from POD 1. Daily dressing checks confirmed no bleeding concerns at the incision site. DVT prophylaxis comprised moonboots starting POD 0. Her pain was controlled effectively with oral hydromorphone contin (6mg, BID) and Tylenol (975 mg, q4h). Patient entered into rehabilitation POD 7 and was discharged home on POD 19 following complete review by our Haematology and medicine teams. The overall leg length discrepancy was improved from 2.5 cm to 1 cm without the need for additional soft tissue release. Bernard-Soulier Syndrome, first described in 1948, is an inheritable bleeding disorder affecting 1:1,000,000 individuals [1-3]. Patients have prolonged bleeding times and are at high risk for spontaneous bleeding with the potential for death. A number of mutations affecting the membrane-bound glycoprotein 1b/V/IX found on platelets have been described to explain this phenomenon. Transfusions of allogeneic platelets remain the definitive treatment for patients with BSS although intravenous injection of recombinant activated Factor VII (rFVIIa) is also effective [1,4]. The potential for developing anti-platelet antibodies with repeat platelet transfusions remains true although Mansour et al suggest that this risk may be lessened for patients with BSS since the 1b/V/IX complex is not associated with a platelet-specific antigen site [1,2,13]. Total hip arthroplasty is a major surgery with significant risks of blood loss, deep vein thromboembolism (DVT), pulmonary embolism (PE) and infection. Estimates of blood loss following THA in patient without a bleeding disorder vary considerably within the literature; from 300-1500 mL with 20-30% risk of DVT or PE [5-7]. Tranexamic acid (TA) is an anti-fribinolytic that inhibits the activation of plasminogen to plasmin with an established role in joint arthroplasty and good evidence to support reduced blood loss with no increased risk of DVT or PE [8,9]. Protocols for TA use, however, vary considerably with no formal guidelines . Doses range from 10-15 mg/Kg for intravenous or oral administration. We provided oral TA peri-operatively and topical TA through the open wound intra-operatively with doses equivalent to 12 mg/Kg po TID and 24 mg/kg respectively. A prospective randomized control trial using topical TA (2g/100 mL 0.9% saline) is described; the results of which are pending . DDAVP use in bleeding disorders is well reported [1,12]. DDAVP binds V2 receptors found on endothelial cells to increase vWF release and promote Factor VIII. DDAVP also stimulates renal reabsorption of water, which theoretically could cause hyponatraemia . We saw a slight drop over the peri-operative period, however values quickly corrected after the DDAVP was stopped. Anaesthesia remains challenging in these patients [1,2]. Halothane is known to inhibit platelet function, while isoflurane and enflurane do not . Importantly, the inhibitory effect of propofol on platelets is not evident at clinically relevant doses and its ease of induction outweighs this theoretical risk . Epidural or lumbar spine blocks and/or controlled hypotension can also reduce potential blood loss by 30-50% . Nevertheless, the potential risk for bleeding in and around the spinal cord cannot not be ignored. We strived for a systolic blood pressure of 100 mmHg intra-operatively and our total intra-operative blood loss was comparable to what we expect in patients without BSS. Furthermore, we only used 1L of 0.9% saline intra-operatively so avoided haemodilution which could potentially exacerbate our existing coagulopathy. We experienced no adverse transfusions reactions despite multiple platelet transfusions post-operatively and Hb remained stable. We avoided use of non-steroidal anti-inflammatories which are known to increase peri-operative blood loss following THA. Similarly, conservative use of narcotics is warranted to avoid extreme hypotensive episodes. We found long acting hydromorphone with extra-strength Tylenol to be most effective for pain control allowing the patient to mobilize quickly after surgery. We made no special concessions regarding the patient’s DDH other than use of the ADM implant and minimal acetabular reaming. This is the first report of a successful THA on a young adult with Bernard-Soulier syndrome. Pre-operative planning is imperative with strong communication between consulting teams. Strict intra-operative haemostasis with limited soft tissue perturbation, limited reaming of the acetabulum and tight, multi-layered closure are instrumental to limit blood loss. The utility of anti-fibrinolytics and DDAVP in BSS patients is clearly borne out in this study. 1. Mansour J, Graf K, Lafferty P. Bleeding disorders in orthopedic surgery. Orthopedics. 2012 Dec;35(12):1053-62. 2. Pham A, Wang J. Bernard-Soulier syndrome: an inherited platelet disorder. Arch Pathol Lab Med. 2007 Dec;131(12):1834-6. 3. Bernard J., Soulier JP. Concerning a new variety of congential haemorrhagic thrombocytopenic dystrophy. Sem Hop Paris, 1948, 24: 3217-3223. 4. Lopez-Vilchez I, Hedner U, Altisent C, Diaz-Ricart M, Escolar G, Galan AM. Redistribution and hemostatic action of recombinant activated factor VII associated with platelets. Am J Pathol. 2011 Jun;178(6):2938-48. 5. Bierbaum BE, Callaghan JJ, Galante JO, Rubash HE, Tooms RE, Welch RB. An analysis of blood management in patients having a total hip or knee arthroplasty. J Bone Joint Surg Am. 1999 Jan;81(1):2-10. 6. Johansson T, Engquist M, Pettersson LG, Lisander B. Blood loss after total hip replacement: a prospective randomized study between wound compression and drainage. J Arthroplasty. 2005 Dec;20(8):967-71. 7. Lieberman JR, Huo MM, Hanway J, Salvati EA, Sculco TP, Sharrock NE. The prevalence of deep venous thrombosis after total hip arthroplasty with hypotensive epidural anesthesia. J Bone Joint Surg Am. 1994 Mar;76(3):341-8. 8. Zhou XD, Tao LJ, Li J, Wu LD. Do we really need tranexamic acid in total hip arthroplasty? A meta-analysis of nineteen randomized controlled trials. Arch Orthop Trauma Surg. 2013 Jul;133(7):1017-27. 9. Claeys MA, Vermeersch N, Haentjens P. Reduction of blood loss with tranexamic acid in primary total hip replacement surgery. Acta Chir Belg. 2007 Jul-Aug;107(4):397-401. 10. Sukeik M, Alshryda S, Haddad FS, Mason JM. Systematic review and meta-analysis of the use of tranexamic acid in total hip replacement. J Bone Joint Surg Br. 2011 Jan;93(1):39-46. 11. Laker, M., Henry Ford Health Systems. Topical Tranexamic Acid and Acute Blood Loss in Total Hip Arthroplasty. ClinicalTrials.gov identifier: NCT01683955. 12. Kemahli S, Canatan D, Uysal Z, Akar N, Cin S, Arcasoy A. DDAVP shortens bleeding time in Bernard-Soulier syndrome. Thromb Haemost. 1994 May;71(5):675. 13. Kostopanagiotou G, Siafaka I, Sikiotis C, Smyrniotis V. Anesthetic and perioperative management of a patient with Bernard-Soulier syndrome. J Clin Anesth. 2004 Sep;16(6):458-60. 14. Aoki H, Mizobe T, Nozuchi S, Hiramatsu N. In vivo and in vitro studies of the inhibitory effect of propofol on human platelet aggregation. Anesthesiology. 1998 Feb;88(2):362-70. 15. Rodgers A, Walker N, Schug S, McKee A, Kehlet H, van Zundert A, Sage D, Futter M, Saville G, Clark T, MacMahon S. Reduction of postoperative mortality and morbidity with epidural or spinal anaesthesia: results from overview of randomised trials. BMJ. 2000 Dec 16;321(7275):1493.